« Happy Merdeka to Malaysians!! The following trip is sponsored by Air Asia. Read up Part 1 and Part 2 if you haven’t :). 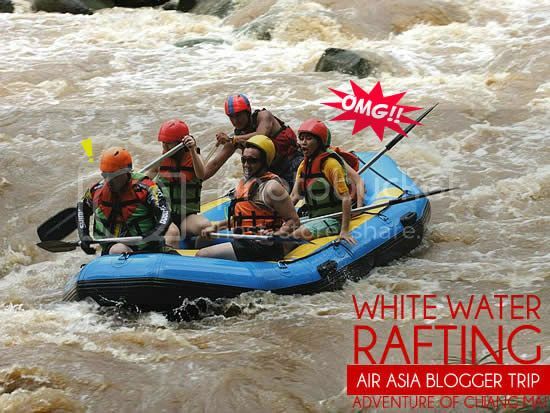 This is my second time water rafting. The first one was in Bali. 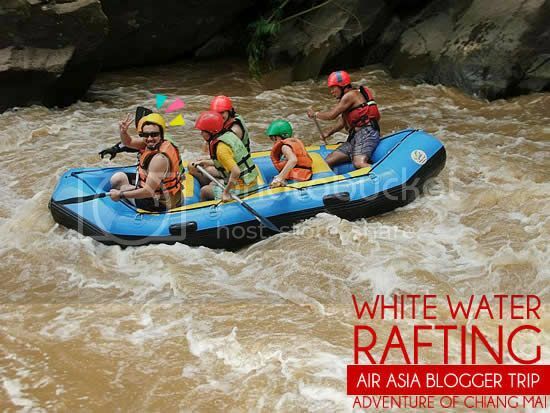 The water rafting we went was called the White Water Rafting which is located at the Mae Tang River. 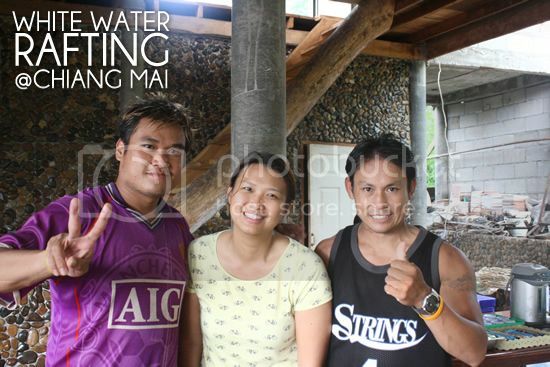 The whole rafting trip is 10km long and took around 1 and half hour to finish depending on the water level and volume. 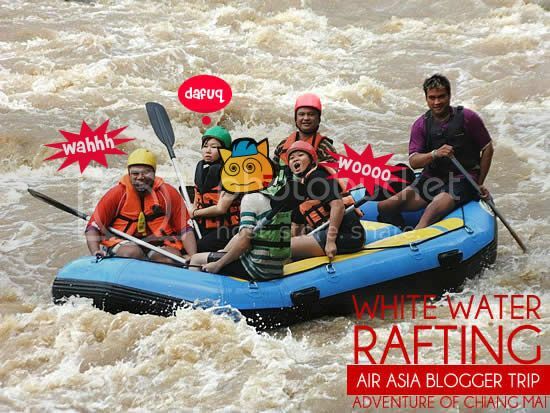 As everyone knows, I’m afraid of water but ironically I like water activities such as water slides, water rafting etc. So it’s like ” OMG! I gonna die!! Oh gosh, this is fun!! Oh no I don’t wanna die!! 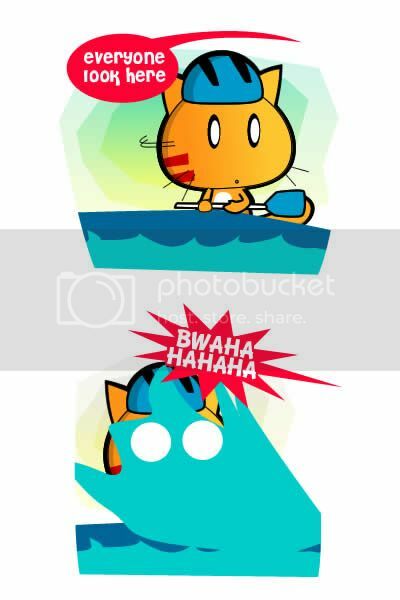 Woohooo” =.= I’m a strange cat. 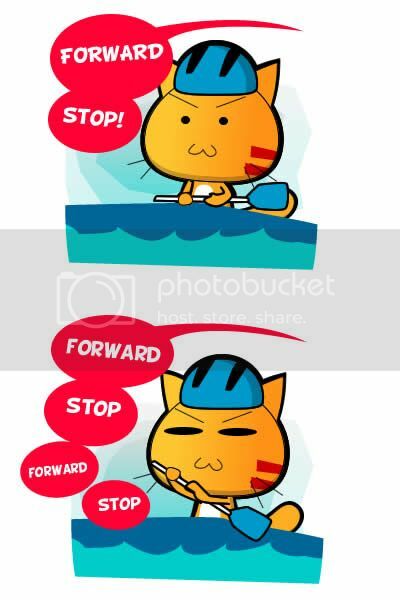 To avoid to meet Wafu Pafu earlier, I was very obedient to all the captain’s command. 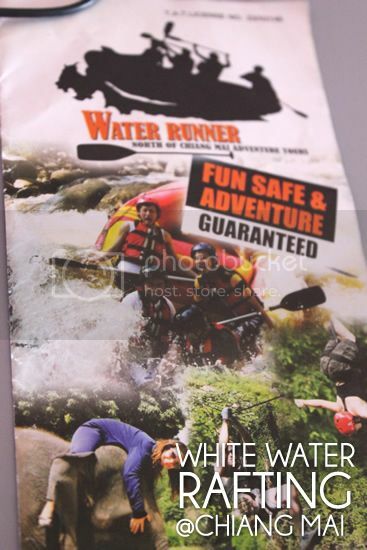 Here’s some photos taken by the guys from the rafting company, Water Runner. As there are many of us, we separated into two boats. It was a fun and exciting ride. Luckily, I didn’t fall into the river. 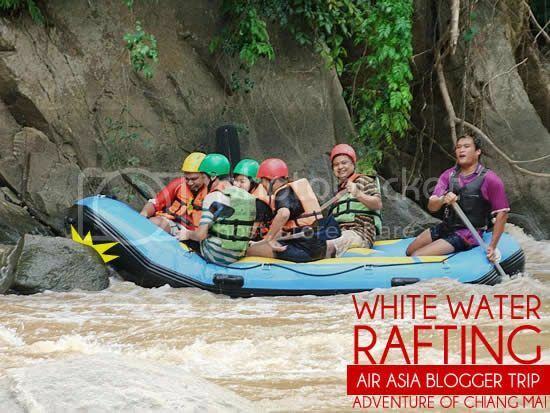 If you’re in Chiang Mai ,do check out the Water Rafting. Here’s our captains and our octopus nanny from Air Asia. There are bathrooms at the HQ, so do remember to bring your towel and extra clothes to change. And importantly, do remember your under garments. At first, it seems fine as I thought we’re heading back to the hotel straight but turned out, we’re not. The tour guide brought us to a massage centre near our hotel. Insecurity to the max!! 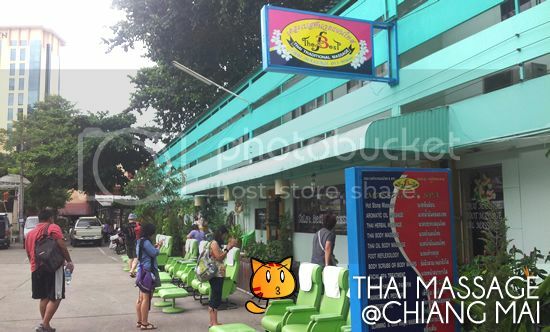 If you come to Thai, do try Thai massage and you will hear all your bones go “Krik Krak” XD. The process is not as painful as it seems to be unless you have not been exercise for many years. 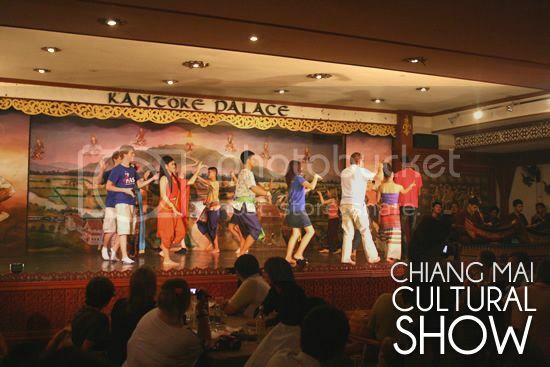 One thing for sure is when it’s finish, you feel more relaxed and light unless the massage parlor is not experienced. For me, I didn’t feel any pain at all :). Oh wait, maybe I was distracted by other stuffs. After the massage, we headed back for a rest before dinner. Thank God!! Saw this pretty young lady play some traditional musics at the lobby before heading out for dinner. Check out the video I took. 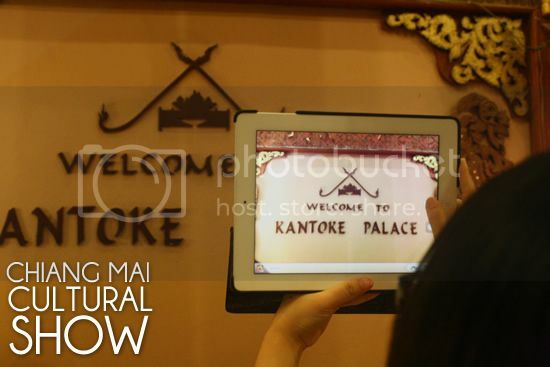 This night, we’re dining at this place called Kantoke Palace. 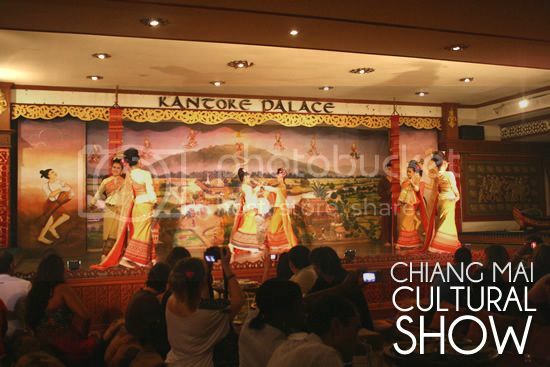 It’s a place where you can have dinner while watching cultural show. 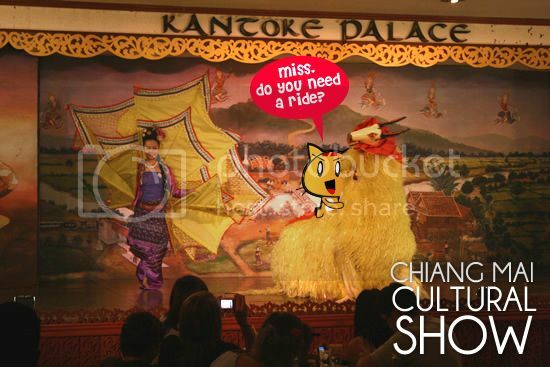 There are a couple of these shows in Chiang Mai. If you’re lucky, you ended up with good food. 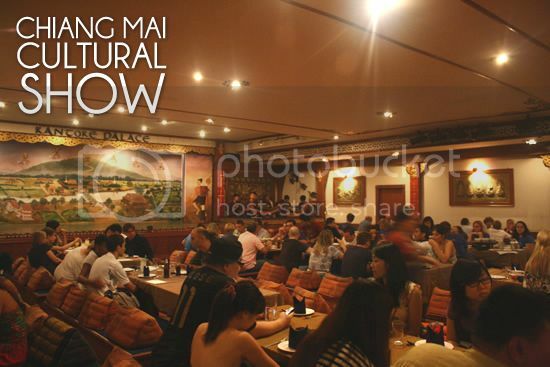 The first time, Chingy came to Chiang Mai, she went to another show and the food was terrible. 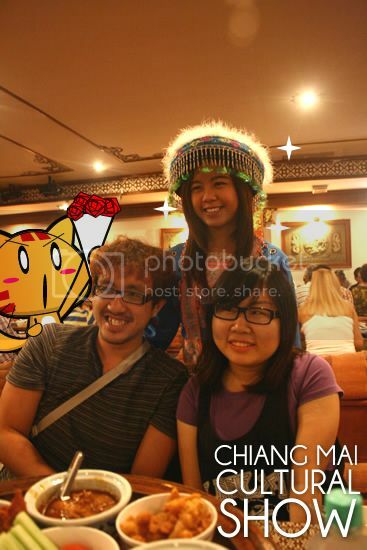 Lucky, they have me, the lucky cat in their trip XD. We had awesome food. This is what we had. It’s a traditional dish that comes in six. 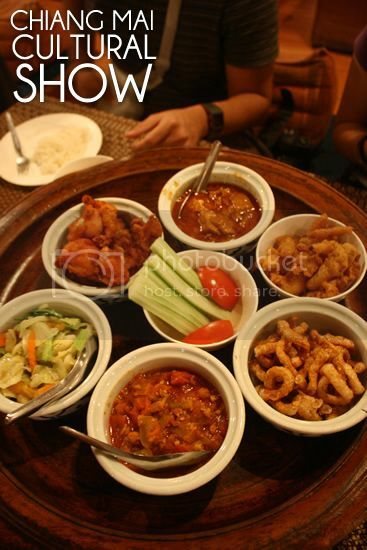 Deep fried Chicken, Curry Chicken, Deep Fried Potato, Fried Pork Skin, Tomato with mixed vege and Cabbages. She’s not a performer but walks around taking photos with tourist and have people buy the framed photos. 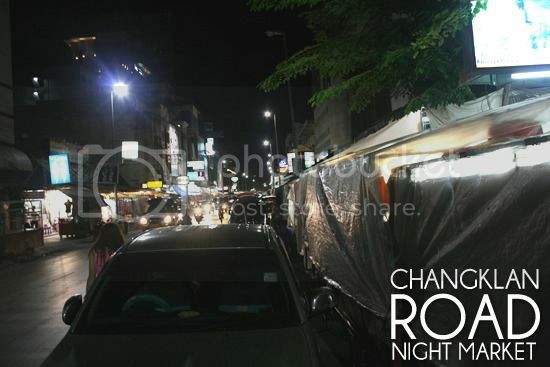 After the show, we went to the ChangKlan Night Market near our hotel again. 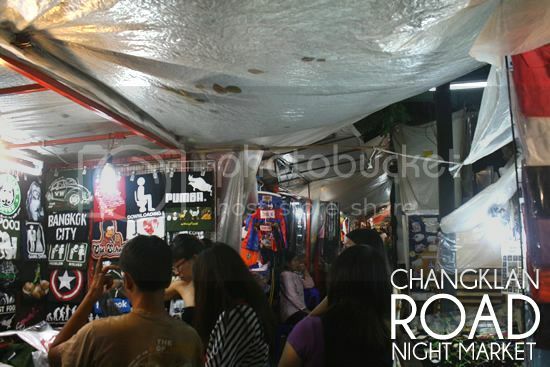 The rest bought a lot of stuffs like paintings & t shirts. There are an area where a lot of artist displayed their work for sale. 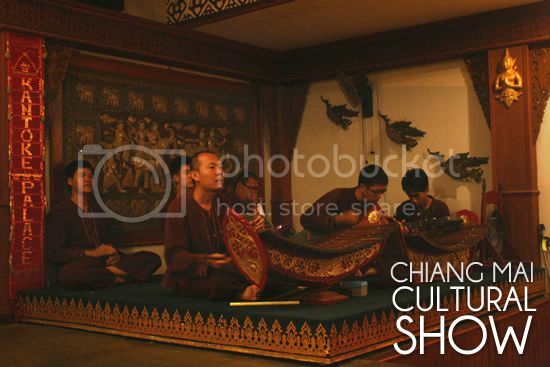 Too bad, they are very strict on taking photograph of their works. I understand them, copyrights. Copyrights are always ignored by people. Many of them just take it from granted and some even make money from it as if they think it is okay. I just encountered the same case and it’s from someone I respected. Le sigh. Anyway, back to the paintings. We encountered something weird, the price for painting appears to be different from the price yesterday but still very worth it. One day when I got my own house, I gonna buy a couple to put in my living rooms. I, myself didn’t bought anything as I decided to save my money for the Sunday Market which would be 10 times bigger and have more varieties of products than here XD. So I didn’t even bother asking for the price of any products. 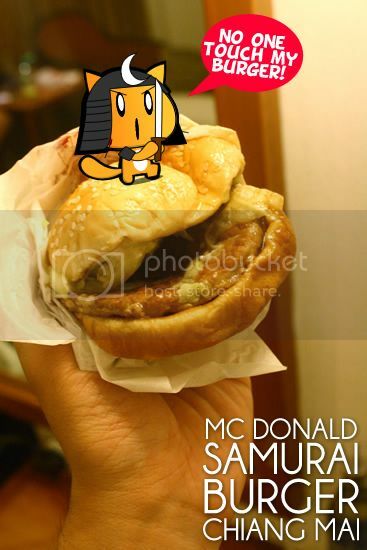 Bwahahha..
It’s actually Grilled Chicken/Pork Patty with Teriyaki sauce. Taste wonderful but still behind my favorite MOS Burger Teriyaki Burger~~ I miss you MOS Burger! 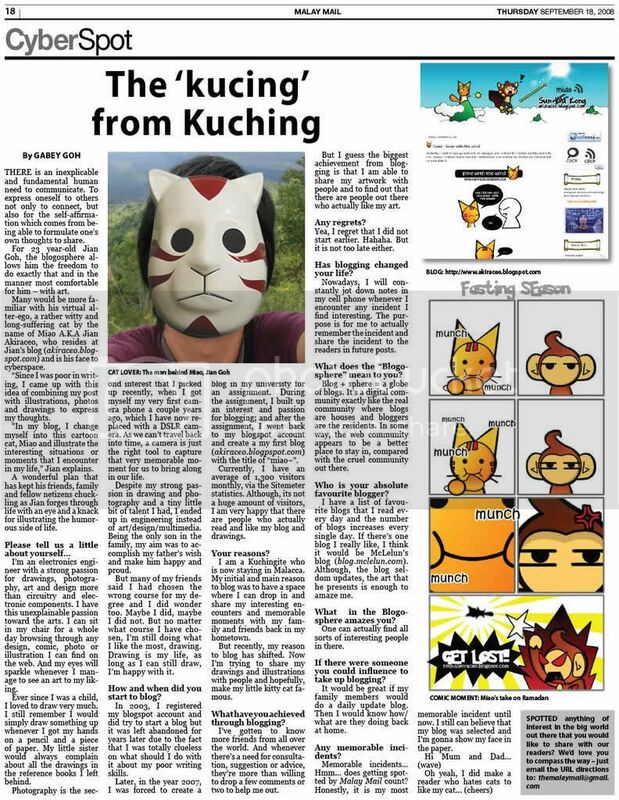 Posted on September 2, 2012 by Jian Akiraceo. 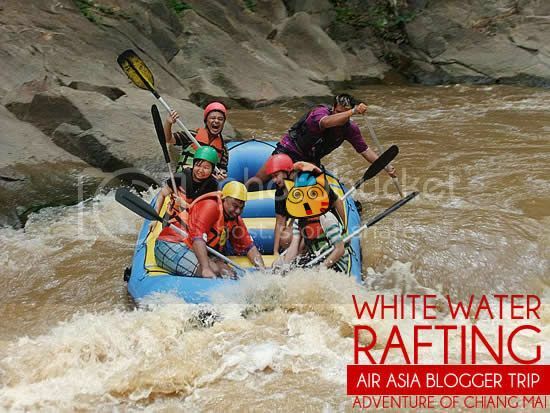 This entry was posted in Thailand, Trip and tagged Air Asia Blogger, Blogger Trip, ChangKlan Night market, chiang mai, comic, Kantone Palace Cultural Show, Mae Tang River, Mc Donald Samurai Burger, miao, Thailand, White Water Rafting. Bookmark the permalink. Nya!!! I wanna be there!!! 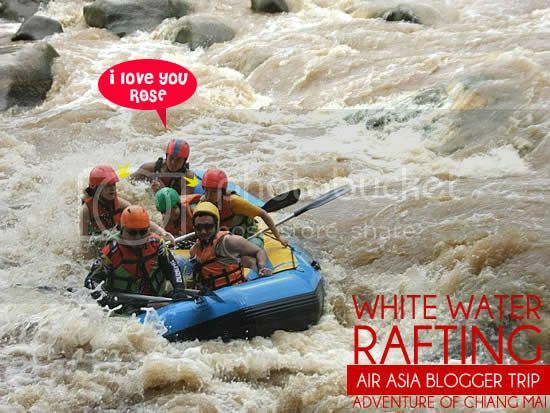 must be a great experience for water rafting~~i wanna try…but..i scared…LOL!! It is!! Try those not that scary 1. Wait! Why we no have? ?